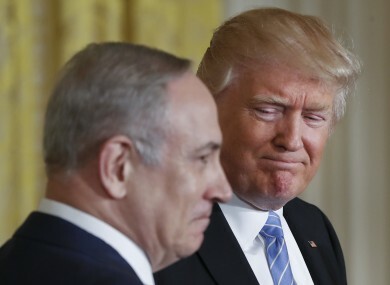 Trump with Israeli President Benjamin Netanyahu today. US PRESIDENT DONALD Trump has halted Washington’s quest for a two-state solution to the Israeli-Palestinian conflict, saying he would back a single state if it led to peace. And – while he urged Netanyahu to “hold back” from building Jewish settlements for a “little bit” – Trump broke with the international consensus insisting on a two-state future. A two-state solution would see two separate states created, while the one-state solution would see both Israelis and Palestinians granted citizenship and equal rights in the entity which combined Israel, the West Bank and the Gaza strip. “So I’m looking at two-state and one-state, and I like the one that both parties like. I’m very happy with the one that both parties like. I can live with either one,” he said. I thought for a while the two-state looked like it may be the easier of the two but, honestly, if Israel and the Palestinians are happy, I’m happy with the one they like the best. This change in the US stance was calculated to please Netanyahu and his right-wing coalition, and Trump’s views on the shortcomings of the Palestinian position will delight them. “I think the Palestinians have to get rid of some of that hate that they’re taught from a very young age,” he said, echoing Netanyahu’s argument that the Palestinians are not ready for peace. Netanyahu had warm words for the Israeli-US alliance, and hammered home his own prerequisites for peace. “First, the Palestinians must recognise the Jewish state. They have to stop calling for Israel’s destruction,” he said. “Second, in any peace agreement, Israel must retain the overriding security control over the entire area west of the Jordan River,” he added. This region contains the entire West Bank area that would represent the heart of any Palestinian state as conceived in all previous international agreements. The previous US administration of Barack Obama had warned Israel that if it did not reach a two-state deal with the Palestinians, it would never reach an accommodation with the Arab world. And he urged Trump’s administration to get on board. “For the first time in the life of my country, Arab countries in the region do not see Israel as an enemy, but increasingly as an ally,” he told Trump. But whatever the view in Cairo and in Riyadh, the change in the US position, which was revealed overnight by a White House official, triggered Palestinian despair and consternation in international capitals. And he implicitly warned Israelis that any single state that emerged would not be a specifically Jewish nation. The new US message deliberately echoed the long-standing Israeli position: No peace deal can be imposed from outside and the agenda for talks must reflect the reality on the ground. Naftali Bennett, the right-wing leader of the hardline Jewish Home party and an opponent of any Palestinian state, cried victory. “A new era. New ideas. No need for third Palestinian state beyond Jordan and Gaza. Big day for Israelis and reasonable Arabs. Congrats,” he tweeted. But Trump’s decision flew in the face of an international consensus that any final status agreement must be based on a return to Israel’s 1967 border — albeit with land swaps. Just five days before Trump’s 20 January inauguration, Obama’s outgoing US administration was among 70 countries to endorse this vision at a peace conference in Paris. And just a month before that, Obama’s ambassador to the United Nations allowed a Security Council motion that criticised Israeli settlement building to pass without the usual US veto. Addressing a US-Israeli conference in December, the then secretary of state John Kerry called settlements a “barrier” to progress. Under Trump, that vision appears dead, and Washington has aligned itself with Netanyahu’s government and its supporters in the right-wing settler movement. Speaking in Cairo after talks with Egypt’s President Abdel Fattah al-Sisi, UN chief Antonio Guterres warned that “everything must be done” to preserve the two-state solution. France, which organised the January peace conference, was also unimpressed. Trump has tapped son-in-law Jared Kushner and lawyer Jason Greenblatt to lead peace efforts. Kushner had dinner with Netanyahu – a long-time family friend – and US Secretary of State Rex Tillerson on yesterday night and attended the White House news conference with his wife Ivanka Trump. Email “Trump says 'Palestinians need to get rid of hate' as he supports one-state solution in Israel conflict”. Feedback on “Trump says 'Palestinians need to get rid of hate' as he supports one-state solution in Israel conflict”.